Safety Chain – Herc Alloy suits trucks and trailers over 3.5t up to 30t. Herc Alloy safety chain is used on all trailers 3.5t to 30t. The use of galvanised Chain and shackles are illegal on all trailers over 3.5t. 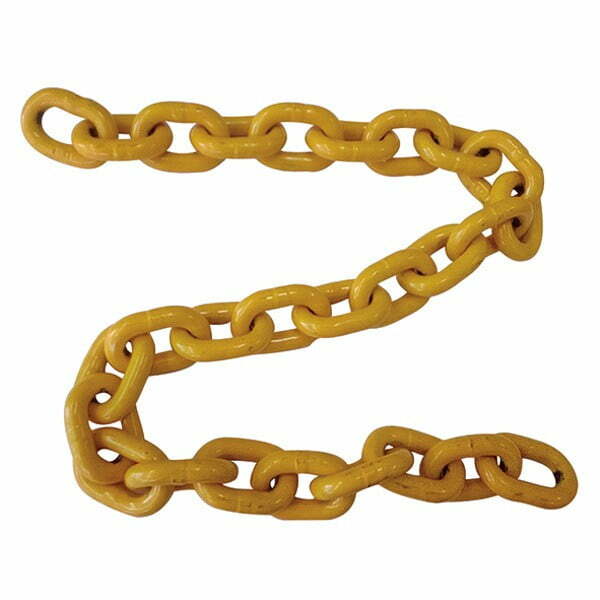 Herc-Alloy 800™ Chain has a yellow powder-coated finish. For 50 years, PWB Anchor has manufactured grade 80 chain under the “Herc-Alloy” name. Still proudly made in Australia, Herc-Alloy 800™ Chain was the first in the grade supporting Australian industry requirements and remains the choice of those who demand 50 years of experience in every lift. Herc-Alloy 800™ Chain is manufactured to the most exacting quality control standards and conforms to the mechanical properties of grade 80 (T) chain. Safety Chain – Herc Alloy Test certificates can be supplied. Chain sizes 6mm to 22mm manufactured in Australia. Furthermore, links to other safety holder parts are here.